A hazard is a process, phenomenon or human activity that may cause loss of life, injury or other health impacts, property damage, social and economic disruption or environmental degradation. Hazards may be natural, anthropogenic or socionatural in origin (UNISDR, 2016). Hazards are often categorized by whether they are natural (sometimes termed physical) or technological (sometimes called man-made or human-induced). The term ‘peril’ is sometimes used instead of hazard, particularly in the insurance industry. Effective disaster risk reduction requires the consideration of not just what has occurred but of what could occur. Most disasters that could happen have not yet happened (UNISDR, 2013). Natural (or physical) events are only termed hazards when they have the potential to harm people or cause property damage, social and economic disruption. The location of natural hazards primarily depends on natural processes, including the movement of tectonic plates, the influence of weather systems, and the existence of waterways and slopes (e.g. that might generate landslides). But processes such as urbanization, environmental degradation and climate change can also influence the location, occurrence (frequency) and intensity of natural hazards (UNISDR, 2011). These processes are known as risk drivers. Each hazard often triggers a sub-set of hazards, for instance tropical cyclones (known as hurricanes in the Atlantic Ocean, cyclones in the Indian Ocean and typhoons in the Northern Pacific Ocean) can bring intense winds, storm surge and heavy rainfall, as well as trigger secondary hazards, for instance landslides. A series of triggering relationships can cause a domino or cascading effect, for instance in the case of the tsunami-earthquake-nuclear crisis in Japan, 2011. The dramatic case of the Navajo Nation in the south-western United States of America shows that much of what are characterized as drought impacts are only partly due to lack of rainfall. Factors including political marginalization and rural poverty have helped to translate meteorological drought into a widespread disaster for the entire people. Natural hazard events can be characterized by their magnitude or intensity, speed of onset, duration, and the area they cover. Hazards occur at different intensities (or magnitudes) over different time scales (sometimes known as temporal scales). Scientists talk about the occurrence of hazards of different intensities in terms of probabilties or return periods (also known as recurrence intervals), within the context of uncertainty. In general, the longer the return period (the less frequent the hazard) the greater the intensity of the hazard. Because of these long return periods, some communities may have no memory of the potential threat of a high intensity hazard. This was the situation in the eruption of Mt Pinatubo in 1991 (the second largest volcanic eruption of the 20th century), which displaced 20,000 indigenous peoples living in its foothills and triggered large mudslides (known as ‘lahars’) which affected people for several years after the eruption (USGS, 2005). Hazards also occur at different geographical (spatial) scales. For instance, the occurrence and impact of tornadoes tends to be quite localised, whereas droughts can occur over several tens of thousands of kilometres. Many countries are exposed to multiple hazards. It is therefore essential to consider the risk related to the full range of hazards that might affect people or assets. 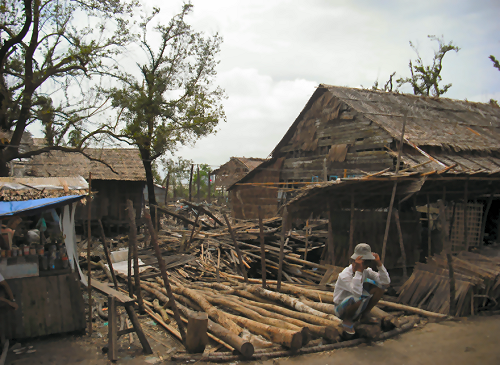 Unfortunately, there have been a number of cases where the full range of hazards has not been considered; for instance following the devastating 2004 Indian Ocean tsunami, some housing in Aceh, Indonesia, was reconstructed in flood-prone areas, meaning families were exposed to future hazard events (Benson et al., 2007). Hazards can also interact; the 1991 eruption of Mt Pinatubo in the Philippines was also accompanied by Typhoon Yunya, which soaked the accumulating volcanic ashfall with rainfall. The heavy weight of the wet ash caused the roofs of homes and businesses to collapse, resulting in most of the 300 deaths directly associated with the eruption (Wolfe, 1992). As this example shows, the interaction between hazards can result in the overall impact being greater than if these hazards had occurred at separate times, which has major implications for risk assessment. The 2011 earthquake, tsunami and nuclear crisis well demonstrates the consequence of cascading hazards and the fact that even high-income, well governed societies can be impacted by extreme events. How do we measure hazards? Essential steps in hazard assessment are identifying the relevant hazard(s) and the collection of hazard-related data. Once the hazards are defined, the next step often involves obtaining a variety of hazard-related data. The most essential data define the date, geographical location and extent, and maximum intensity of historical events. A collection of the spatial, intensity, and temporal characteristics for events in an event set is termed a hazard catalogue. Hazard catalogues can be used with risk models in a deterministic or probabilistic manner. This process may include difficult decisions, such as whether to consider secondary (or chains of) hazards that might be triggered by a primary event (e.g. a fire after an earthquake) and/or the interactions between hazards. Historical events are often used in deterministic analyses that assess the impact of past events with current exposure, but can also be used to estimate the probability of a hazard occurring at a location with a specific intensity. However, we have already identified that high intensity hazards tend to occur infrequently and have long return periods. This means that many of the intensities of hazards (and ultimately disasters) that could occur have not yet happened, which is particularly the case for geological hazards because they often occur over long time periods (UNISDR, 2013). Historical records of these types of events do not show the true picture of hazard return periods. Computer generated hazard events with statistical characteristics consistent with the historical record are therefore used to ""complete"" hazard catalogues (UNISDR, 2015a). Such event sets can typically include thousands or tens of thousands of potential events and are intended to define the full range of potential events for a hazard. Event sets are used with information on exposure and vulnerability to quantify probabilities of loss and risk from a hazard. A probabilistic risk model contains a compilation of all possible “impact scenarios” for a specific hazard and geographical area. Note that hazard catalogue are generally associated with rapid onset hazards. Risk assessments for slow onset hazards, such as drought, are typically undertaken using deterministic approaches. The adverse impacts of hazards, in particular natural hazards, often cannot be prevented fully, but their scale or severity can be substantially lessened by various strategies and actions. Improving our knowledge of hazards and conducting hazard assessments can help us to locate and, in the case of some hazards, anticipate over different time-periods when these might occur. Anticipation ranges from probabilistic analysis of long-term hazard occurrence, to the monthly, daily or even hourly detection and monitoring of hazards, in order to inform early warning systems (EWS). Warning systems must be accompanied by strategies for disaster risk reduction in order to reduce vulnerability and enhance people’s capacity to respond and recover from a disaster. In the case of slow-onset hazards, if early indicators of a potential crisis are detected then warning can be a key tool for building resilience, as exemplified by food security early warning systems (DFID, 2004). Effective EWS include four components: (1) detection, monitoring and forecasting of the hazards; (2) analysis of the risks involved; (3) dissemination of timely and authoritative warnings; and (4) activation of emergency preparedness and response plans (WHO, no date). These need to be coordinated across many agencies at the national and community levels for the system to work - failure in one component, or lack of coordination, can lead to the failure of the whole (WHO, no date). Currently it is not possible to warn when earthquakes will occur, but we can say with some reliability where they might occur and so we can mitigate the impact of earthquakes by implementing strict building codes and raising awareness of how to respond. It is also challenging to warn for volcanic eruptions. There can sometimes be activity prior to eruptions (known as precursors) that, if monitored, can give an indication of when an eruption might occur, although determining the exact timing of an eruption is not yet possible. Eruption precursors are used to inform early warning systems, which provide a range of alert levels with accompanying safety information. However, in spite of improvements in raising awareness and early warnings around volcanoes, some ‘high-exposure’ volcanoes remain unmonitored (UNISDR, 2015a). For landslides, we can predict their occurrence based on triggers that we can provide warnings for, such as heavy rainfall, but not in the case of sudden triggers, such as earthquakes. Early warning systems (EWS) are a critical life-saving tool for floods, droughts, storms, bushfires and other hazards, across developed and developing countries.